It started on Tuesday, when Andrea Tantaros was a no-show on Outnumbered. As her absences from Fox News continued, people started to wonder what was up. TV Newser got a tip and Chris Ariens, a savvy and tenacious Cable Gamer, published the response from Fox News explaining it as issues “regarding her contract.” The source ominously added that FNC “determined” she needed some time off. PumaByDesign: There are rumors that Karl Rove and Dana Perino don’t want her contract renewed. That last appears to be based on nothing whatsoever beyond a tweet from one Josh Cornett saying “many have speculated” this (we haven’t found anyone who has, other than Josh Cornett). TV Newser noted Tantaros was scheduled to call in to Bill Cummingham’s show, but cancelled. Her exile from Fox News began on the same day her book was published. Outnumbered did a two year anniversary show that never mentioned her, either on air or during the web-based “overtime” segment. Tantaros is running silent on this matter, ignoring all questions on the subject. Contract employees are usually permitted to promote books on other channels and broadcast outlets. 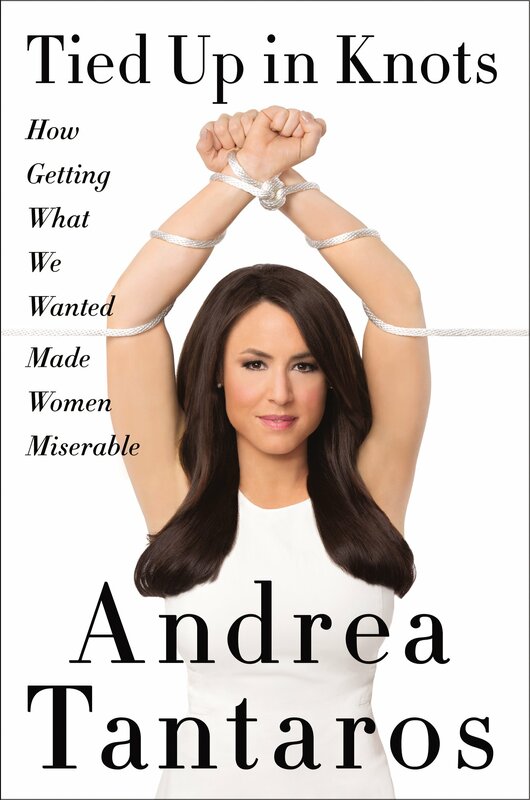 But Andrea Tantaros has done no on-air promotion for her book that we know of, cancelling at least one scheduled appearance. The Cable Gamer thinks it’s no coincidence that Andrea’s forced vacation began the same day her book promotions were supposed to start. She has a reputation for being feisty, maybe even a little pushy (she managed to promote herself from the gaggle of rotating Outnumbered panelists to a permanent role, on a par with journalists Harris Faulkner and Sandra Smith). Yet she has been uncharacteristically quiet, both on social media and in promoting her book. (Harper Collins can’t be pleased to see the premiere week go down the drain without any detectable on-air publicity.) Since Andrea was reminded she is “still under contract with the network” that could mean Fox decided not to give her the customary waiver to promote her book on other outlets. Surely she would be doing promotional appearances if she had permission. All of this suggests a big blow-up between Andrea Tantaros and the Fox News powers that be—maybe involving the promotion of the book. Apparently it escalated into a confrontation with The Wrong Person, because the result is that Andrea Tantaros has effectively been a non-person at FNC for four days running. This is not typical of how Fox News handles internal conflicts. The Cable Gamer has a feeling we’re only seeing the tip of this iceberg, and things may not end well for Andrea Tantaros. UPDATE: The Cable Gamer has learned that Andrea Tantaros has cancelled several radio interviews, not just the one with Bill Cunningham. Also, special thanks to Hot Air and Johnny Dollar’s Place, along with FTV Live and Conservative Treehouse. Their links have helped make this our most-read, most-discussed post of all time. UPDATE 2: Andrea Tantaros has spoken out, sort of, about this controversy. See our follow-up post. The Wrong Person is the theory I trotted out on Twitter. We’ve seen on Out# Overtime that she’s willing to snap at a guest on air and leave the set, so it wouldn’t be entirely surprising to hear she went there with someone with more power and less tolerance. Whatever she did must have been a doozy ’cause they completely shut down her book promotion on opening day. Well, she’s referred to a boyfriend before, and it’s Spring – wedding season! Perhaps she’ll be back, with a ring on it? What would possible marriage have to do with Fox pulling her off the air? Your comment makes no sense. Marriage is usually followed by a honeymoon; which could be a week or two, if there’s vacation time accrued. Bill Sammons daughter was Rubio’s communications director. Sammons is Foxnews exec. Perhaps Sammons was the “wrong person”…. Bill Sammon (no “s”) is an editor in the DC bureau. It seems unlikely he’d have much influence over what they’re doing in New York. Rubio’s been out of the race for some time now so I’m not sure what that would have triggered this week. But with all we don’t know, I can’t say you’re barking up the wrong tree either. Uh, Bill Sammon is Fox News Washington managing editor and a vice president for the network. A bit more than “just an editor”. Bill Sammon is Fox News Washington managing editor and a vice president for the network. Rather a bit more than just an editor. Yes I should have said managing editor. He’s one of several VP’s but he’s in DC and does he exert the kind of influence over New York programming that could get someone bumped off one of the channel’s top-rated daytime programs, because of a campaign his daughter worked on that’s been defunct for weeks? And what happened on Monday that would have triggered that? I don’t rule anything out but it just doesn’t sound likely to me. Your milage may vary. May 1, 2016 - 4:32 am Pingback: Andrea Tantaros mysteriously vanishes from Fox News - Spirichuality - None of the bias, all of the sources. These things are almost always about money/loyalty/ratings. Roger Ailes has a reputation for paying Fox’s on air talent very well. He also has a reputation for being fiercely loyal to that talent and he expect/demands loyalty in return. If they won’t let her promote her book elsewhere, I’d bet her relationship with Fox is probably over. I’d observe that CNN has been picking off attractive conservative women the past year or two. Just yesterday I read that CNN beat Fox with a certain demographic for the first time in 14 years. I suspect Tantaros got an offer from someplace else and tried to use her position on “Outnumbered” as leverage to get Fox to either match it or let her out of her contract. Now she’s learning the hard way how much leverage she really has. There does seem to be a restriction on Fox hosts/contributors promoting books on other channels. I never saw Kirsten Powers or Dana Perino do the kind of on-air book tour Ron Fournier is on right now; maybe Tantaros balked at being balked. It’s isn’t likely that they would. Ron Fournier doesn’t work for a news network so he doesn’t need permission to appear elsewhere. Both Kirsten and Dana did publicity on other outlets—mainly radio, as CNN and MSNBC have little interest in publicizing their biggest competitor. I’ll grant there wouldn’t have been off-network interest in Kirsten, but there definitely would have been interest in an ex-Press Sec from MSNBC, especially Scarborough and Matthews. That’s a fair point. Cross promotion among the big 3 news networks happens much less frequently than somebody going on Comedy Central. In other news, that book cover is ridiculous. 50 Shades of Fox Host. May 3, 2016 - 9:13 am Pingback: Andrea Tantaros: Did Fox News Fire Pro-Trump ‘Outnumbered’ Host? miss her being on the show, I think it has more to do with her support of Trump than anything else. The VP of Fox is a big Hillary supporter. I know people are not suppose to pick sides as a reporter or news personality but to my way of thinking she has a right as a citizen to support the candidate of her choice. There’s plenty of Fox hosts open supporting Trump, do it must have something to do with the way she’s going about it. If she’s behaving off set the way she did towards Rich Lowry on Out# Overtime, that could be a problem. I would think that hosts supporting different candidates would lead to a little friendly sparring on-camera, which would add interest to the show. I don’t watch “Overtime”, so I don’t know what happened with Mr. Lowry; but I can’t imagine someone as savvy as Miss Tantaros would get truly offensive during a broadcast; even only on the internet. And Mr. Lowry isn’t the type to provoke someone over the edge, either. Tantaros got mad at Lowry over criticism of Trump and stormed off set. You could have easily Googled this instead of implying I made it up. It’s just astonishing that she’d get so mad she’d do something so unprofessional. Other Outnumbered cast members have been disciplined recently, so she’d be aware that antics have consequences. Didn’t Stacey get suspended for something a month or so ago? And her The Five colleague Bob Beckel was fired outright. And in their cases, no bones were made about the problems, but her case is hush-hush. It just doesn’t make sense! Well, she was already moved off one very successful show, The Five, which was a big upgrade for Guilfoyle. At the time I thought it was intended to help Outnumbered, but in retrospect it’s looking more like a demotion. Tantaros is quite successfully insane on air – the fans love it – but maybe it carries a little too far when the cameras are off, too. Rich Lowry said that’s not so. I’d have to look it up but the gist was she couldn’t stay for the online show and that was known ahead of time and had nothing to do with their earlier dispute. I believe that’s some revisionist history from Mr. Lowry. AT yanked off her mic and bailed, and Harris was clearly surprised. That’s not what happened. In fairness to @AndreaTantaros she left bc the show was over and we were doing an online extra. Its edited dishonestly to make it look like @AndreaTantaros stormed off. I’m saying anyone watching it is very likely to get a mis-impression. If there’s an unedited clip showing Harris clearly surprised I’d like to see it. I wouldn’t know how to find it now, but I saw the entire clip, which lasted about 5 minutes (I was told this segment is usually about 15 minutes long). She left and the group made comments wondering if she was coming back, then carried on a few minutes more and ended the bit. It was very clear to me that AT got mad and left. I appreciate that Lowry would want to clean it up after the fact, but his representation that somehow an edit changed how it looked rings hollow to me. I will be charitable and say you are misremembering. Her leaving started in the break between the end of the on-air program and the start of the online extra. When she online show began she was already standing up and on the way out of the camera shot. Harris Faulkner said to Lowry “How was your hour?” Because they had finished the on-air show and were just starting the online extra. Lowry joked that Andrea had walked out on him, and she yelled something back (I don’t remember what). There was no opportunity for Harris to be surprised on camera because Andrea got up to leave before the segment began. There was no way Andrea could have gotten up and stormed off in outrage over some point in the discussion because there was no discussion going on; they were in the break of about 30-60 seconds between the end of the on-air show and the online extra. Rich Lowry’s recollection a couple of hours after the show coincides with mine. Yours doesn’t match either one. And it seems you haven’t found anything online that matches it either. Even the guy who made the edited clip admitted to Lowry and tweeted out an explanation that his video juxtaposed two clips from different parts of the program. The sequence you describe didn’t happen. But maybe you’ll turn up that clip. If it was as dramatic as you describe it should be posted on dozens of sites. I remember it the way I remember it, and I don’t believe what I saw was something inexplicably on camera between two segments intended to be on camera..that doesn’t even make sense. Which is all beside the point, anyway: We’re conjecturing about why Fox suspended her based on her one cryptic explanation of it. None of us knows. I just found the clearly spliced together Twitter clip, which is only 30 seconds. It’s impossible to follow a timeline of events from it, and I’d never seen it before. What I saw was a tape of the entire Overtime segment, which is no longer searchable. That’s the best I can do. If Andrea is gone because of political reasons. This tells everyone how bias the media is and if ot don’t fit their narrative your out. The media cronies is as crooked as the piliticians. We want Andrea Tantaros back. We have not seeing her anywhere. is she OK? We want to see that shes well. She gave character to the show. I am about to stop watching, Outnumbered, w/o her its boring. I would be patient a couple of weeks more. She’s got a background in political marketing, she’s a Trump supporter, and Mr. Trump is hiring. On-air personalities have gone off-air when they joined a political campaign; and it may be that this is what’s happened. If so, she should become visible at the Republican Convention. And since it’s hit the fan, and Fox News may be loosing people, perhaps she’ll be back on the air soon. Hope so!